Was Fitz a Better President or Boyfriend to Olivia Pope? Fitz might not be in Scandal's White House, but that doesn't mean you've seen the last of him on the ABC series. At the end of the second episode of season seven, Tony Goldwyn made his triumphant return as Fitz…only to find Olivia (Kerry Washington) bringing home another man. "You will find out what's happening [in Vermont] and always in Scandal it will get much more complicated than it initially appears," Goldwyn recently told E! News on set of Scandal's final season. With Fitz in Vermont is Marcus, played by Cornelius Smith Jr. The two are up there, doing foundation things not involving jam. Jam is of course reserved for Olivia Pope. When viewers last saw Marcus, he was in an off-and-on relationship with Mellie Grant (Bellamy Young), who is now the president. Will that be back on again? Watch the video to find out. 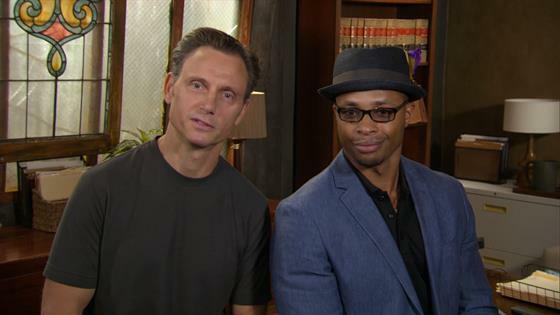 As for Fitz and Olivia, "I think he and Olivia are each other's own worst enemies in that regard. He certainly tried to be a good boyfriend. From Fitz's point of view, Olivia worked pretty hard to push him away," Goldwyn said. "I think it's OK to say that Fitz is not done trying." Scandal airs Thursdays, 9 p.m. on ABC.